I don’t buy a lot of specialty type drinks at convenience stores or delis. I go in, I get my coffee, I might grab a sparkling water if I’m feeling festive and I get on with my life. No Sobe-Vita-Fuze-Izze-Gloji-Steaz amped-up water, juice or tea for me. This morning, however, I was waiting for my breakfast sandwich (egg, cheese and tomato on an English muffin, if you must know) when this shapely hydration option caught my eye. Then when I saw all the wonderful things it was promising, well, I just had to have it. Done. Basically, ready to purchase. Yeah, there are a lot of trademark and registration symbols on this drink, now that I think about it. A quick perusal of the back label further confirmed my excellent choice as I sidled up to the register to plunk down my cash. 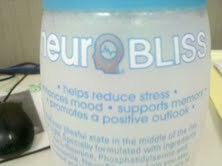 “neuroBLISS helps reduce stress, enhances mood, supports memory, promotes a positive outlook.” Holy hype, if anyone needs a more positive outlook, it’s this girl right here. Where can I get a case of this magic elixir immediately? Now, I’m thinking about purchasing a case of this stuff before I’ve even taken a sip. I’m what marketing people might call, “a mark” or “a tool.” Whoever wrote this crap is a freaking genius. As a fellow writer of propaganda, I tip my hat to you, sir or madam. Please know you’re work has not been in vain. I, of course, start scouring the ingredients list to try to ascertain which specific ingredient might be so powerful as to improve my whole outlook. Carbonated water – no. I drink that all the time and still have a negative outlook. Crystalline fructose – maybe. Probably not. Gum acacia? Well, I do like gum… L-theanine? Yeah, that’s probably it. And this Phosphatidylserine stuff. Yeah, the interwebs says that’s for memory. Good to know. Hmm, the interwebs also says potential side effects from Pho-I’m-not-gonna-spell-that-again include gas, upset stomach, and insomnia. What the what?? I thought this stuff was supposed to help me “stay focused and feel good.” What’s so good about gas and an upset stomach? 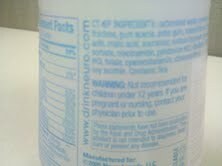 Uh-oh, there’s also a warning on this bottle: “Not recommended for children under 12?? If you are pregnant or nursing, contact your physician prior to use?! ?” What does that mean? UGH. I’m so disappointed. I really believed it. And it was all a lie. But I will say, it’s pretty tasty. Kinda like a Fresca, I think. And the bottle really is pretty. I don’t know if it’s “blissfully” pretty, but it’s nice. What about you guys? Do y’all drink any of those fancy drinks? Any recommendations? Noticeable side effects? Please, share!